Madeline is a woman of few words. She chokes and stumbles awkwardly when asked to express her emotions. But put her on a river and it’s another story. Her actions speak louder than any words could express—she is in her element. 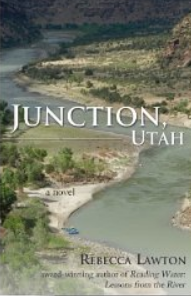 Rebecca Lawton has translated Madeline’s words and world in her first novel Junction, Utah and one can tell that she knows whereof she speaks. The river is a metaphor for danger, thrills, anger, and fear — four dominant emotions in Madeline’s “Seven Dwarves” of feeling words. In the midst of white water chaos and confusion she can avoid the reflective eddies of painful emotions: longing, sadness and grief. When she finally steps on shore and meets her unlikely match in Chris: a land locked farmer and self described ‘Jack Mormon’ who has been held underwater by his own grief, Madeline can finally add love to her emotional repertoire. This book has a love line, but it is not a romance novel. Initially plots, subplots and characters, flashbacks and backstories come fast and furious in a confusion of whitewater that breaks over the bow of the story. But when it settles down to the connection between Madeline and Chris: with their mutual goal of protecting their beloved land and water, things become clearer— broad and determined like a large river moving to meet an inevitable sea. This book provides a great example of including the setting as a character. Rebecca describes sensory details of Utah so vividly, it’s no wonder she has received recognition among western writers.